There seem to be perpetual long queues at this Mong Kok food stall. 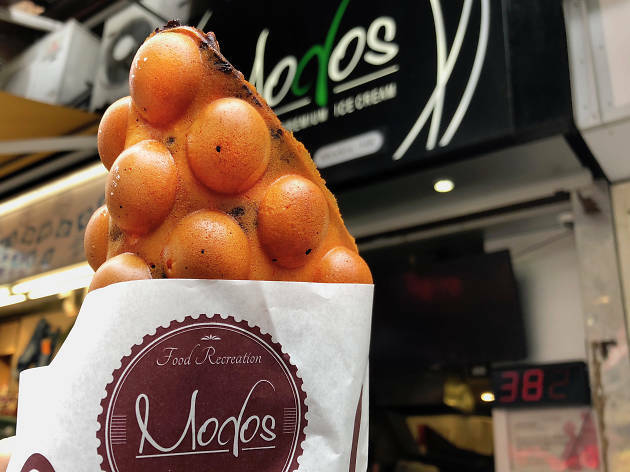 Modos attracts hundreds of foodies daily thanks to its huge variety of eggettes including some unconventional flavours such as Moringa, Jacob’s Chocolate Orange, spicy meat floss and even Russian Borscht. We went for the Morgina gai daan zai, which was light and has that great eggy aroma. 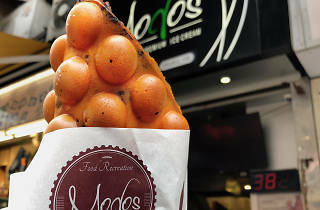 We also tried the chocolate orange, where the chocolate chunks are delightfully gooey. The eggettes were freshly made, resulting that perfect crunchy-on-the-outside and -soft-on-the-inside effect. The only thing we have to complain is the gai daan zai were quick to soften.